In comments to my previous post I made this statement of historical fact: “home price bubble equity was an ATM that grew consistently as a fraction of PCE after 1996, and accounted for over 2% in 2005 – and I got this from Greenspan and Kennedy, Table 2.” In my estimation, this implies that the collapse of the housing bubble eliminated the possibility of equity extractions, and was therefore a major contributor to the decline in personal consumption expenditures [PCE] that led into the Great Recession. Bill McBride at Calculated Risk has been following the equity extraction data. Here is the March, 2014 update. Dr. James Kennedy, mentioned above, wrote that for technical reasons, the data set that he and Greenspan were using was no longer valid after 2008, and presented an alternate calculation method [link at the linked CR post.] McBride uses this alternate measure, calculated from the Fed’s Flow of Funds data and the BEA supplement data on single family structure investment. Also linked at the CR article is a spread sheet with the two data sets. 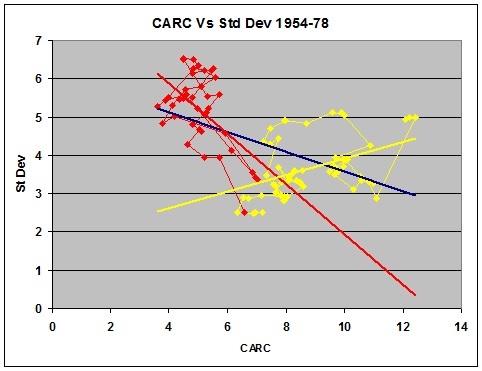 Graph 1, from CR, shows how the two data set compare. Graph 1 – Equity Extractions – G-K Data vs CR Calculation. Did the Fed Cause the Great Recession? With the release of the Fed’s Open Market Committee Meeting minutes from 2008, it has been confirmed that the Fed was too concerned about inflation, and, to quote Marcus Nunes, “worse, the headline kind” leading into the 2008 crash. The Market Monatarists cite this as evidence that the Fed was responsible for turning a potentially pedestrian downturn into the Great Recession. See David Beckworth here. I’m not here to defend the Fed, but there are two issues. The first issue is their behavior – and if they mistook 2008 for 1978, that is inexcusable. By their words shall you know them. But only if you’re paying attention. Let’s look more closely at that first issue – Fed behavior. What was happening with inflation, and how did the Fed react? Graph 1 shows headline inflation in blue and core inflation in red. My last Angry Bear post generated such a wonderfully amusing comment stream that I couldn’t resist posting a follow up. One of the criticisms was that I didn’t consider Real GDP per Capita. At the risk of having anyone think I accept homework assignments from trolls, here is a look at that very thing. I’m snowed in tonight, so what the hey. 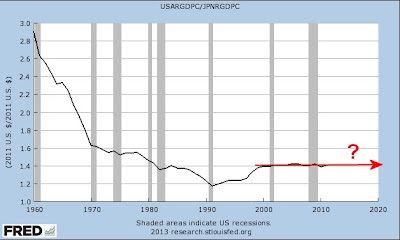 I usually like more finely granulated data over a longer time span, but sadly discontinued FRED series USARGDPC gives us annual data from 1961 through 2011, and that’s plenty good enough to make a point; the point being that the American economy is dying a slow and agonizing death. This, alas, despite enormous tax cuts enduring over decades. For the supply-siders among you, we’ll take an extra special look at the Reagan years. 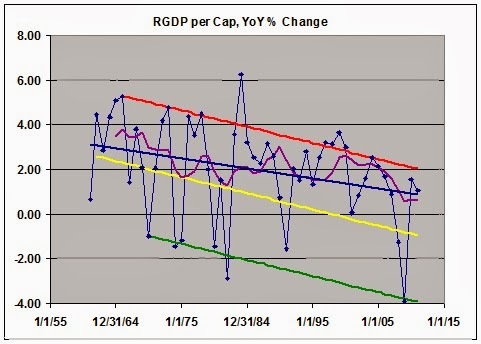 Graph 1, from FRED, shows YoY RDGP growth over the span of the data series. The single most prominent feature of this trace is the downward trend over time, characterized by both lower lows and lower highs. This should be pretty obvious, even to the causal observer; but if you cannot see it, don’t be disturbed, I’m going to help. Graph 2 shows the same data, along with some trend indicators. Parallel trend channel boundaries are indicated in red and green, with the center line in yellow. The Excel generated least squares trend line is in dark blue, and a moving 5 year average in purple. Each of these additions is a visual aide, indicating that the trend over time has, indeed, been down. Certainly, it has not been monotonic. The real world seldom works that way. But what you see here, with some exceptions, are mostly worsening recessions, and increasingly anemic recoveries. Next, let’s focus in on the 5 year average. Graph 3 gives that to us, along with it’s own set of trend lines. The vertical axis is truncated relative to graph 2, and the downward slope is therefore emphasized. This makes it easier to see that the 1990 peak is considerably lower than the double peak of ’66 – ’69. The 5 year average is in purple. The base data and least squares trend line are in grey, The red, green and yellow lines are again parallel channel boundaries and midline. The last time the average line touched the top channel border was in 2000. After that, despite the Bush tax cuts, things went into a bit of a decline, culminating in the worst financial disaster since the Great Depression. I know what you’re thinking. The next to last peak in Graph 3 came in 1990, the culmination of the Reagan miracle, just before his buzzards came home to roost, costing Bush Sr. his chance at a second term. But remember that that peak is considerably lower than those of the 60’s, and scarcely above the mundane years of ’70 to ’73. And back in graph 2, the highest single growth year ever was in 1984, the third year of phase-in for Reagan’s 1981 tax cut. Well, sure – but note that 1984 was a one-off, and also the recovery year from an exceptionally deep Fed-induced double-dip recession in the previous 3 years. So, beside a lot of pent up demand, there were a few other things going on that might have given RGDP a boost. Graph 3 shows the Effective Federal Funds Rate, which made an erratic drop from a high of just over 19% in mid ’81 to 15% in early ’82, then to under 9% by 1984. Graph 4 shows the explosion of credit that occurred coming out of 1982. By 1984 it was close to an all time high. It finally reached that peak in 1986, then collapsed.for the rest of the decade. And let’s not forget that Reagan was responsible for what was at that time, the most profligate explosion of federal spending ever seen, as shown in Graph 5. Big picture: Decades of tax cuts have not led to increasing prosperity. Quite the opposite. The growth rate of RGDP per capita has declined substantially since the tax cuts of the 60’s, and most severely since the 2001 tax cuts. The ensuing change in RGDP/Cap growth is somewhat reminiscent of what happened from ’69 to ’75, but as yet without much recovery. Focus on the Reagan years: After a long and deep recession, tax cuts plus the steepest decline in nominal interest rates ever seen in the 20th century, plus a huge expansion in federal spending, plus an explosion in credit resulted in a single year of outstanding GDP growth, followed by four decent but less than stellar years, which incidentally also included the 1986 tax cut. Then, alas, in 1991, there was another recession. If you can look at this data and still have the opinion that tax cuts boost the economy, then knock yourself out. Everyone is entitled to an opinion. But you might want to ponder why your opinion has so little overlap with reality. I welcome your comments, but please keep them more or less relevant to the topic, and if you are going to disagree, please bring more than assertions. Facts and data have some gravitas. The Republican response to the President’s State of the Union message was delivered by Washington State Rep. Cathy McMorris Rodgers. It was personal, platitude-ridden, overtly religious, twee, and devoid of policy content or anything else of relevant substance – other than a naked assertion that BHO’s policies are making life harder in myriad unspecified ways. In other words, it was the most you could expect from an intellectually bankrupt party whose only agenda item is to make the President fail. So the opportunity to have tax cuts do much to promote real economic growth is somewhere between slim and nonexistent. Let’s look at the actual information we have on tax rates and Real GDP growth. * Graph 1 shows the top marginal rate in blue and the capital gains rate in green from 1950 through 2011. Also included in brown [right scale] is the YoY percent change in RGDP [annual data] and a linear RGDP growth trend line. The major trend in each of these phenomena slants down over time. 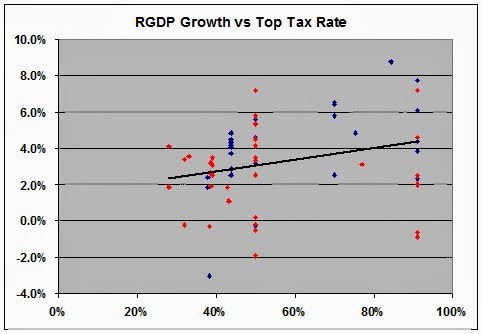 Graph 2 is a scatterplot of RGDP growth vs top marginal tax rate, same annual data as in graph 1. The points are color-coded Red for Republican administrations, and blue for Democratic administrations. Again, a trend line is included, showing a positive slope. I find it interesting that the space below the trend line is dominated by red dots. You might not. The data arranges itself in columns because the tax rates tend to remain constant for several years at a time. There is a great deal of scatter since many things besides the tax rate influence the economy. The simultaneous general abandonment of a Keynesian approach over the period is notable in this regard. It might be a bit simplistic to think that a current tax rate influences GDP growth in the immediate year, so I took some long averages and redid the scatterplot. 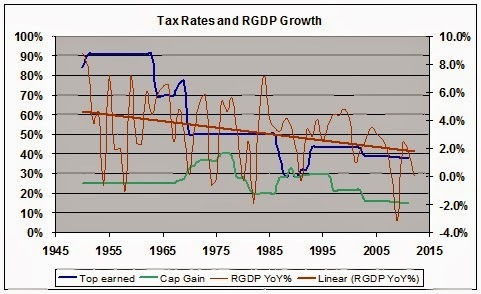 Graph 3 is a plot of the 8-year averages of both top marginal tax rate and RGDP growth. This has the additional advantage knocking down the data columns. 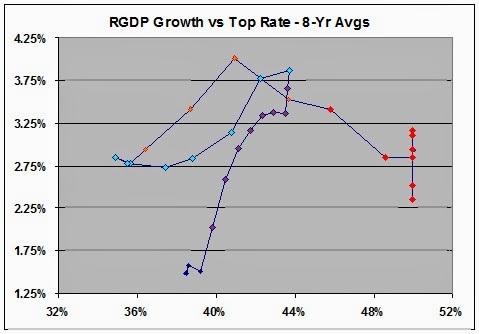 Graph 3 – Scatterplot of RGDP Growth vs. Top Rate, 8-Yr Avgs. The 8th year of each administration that lasted that long is indicated with a red dot for Republican and a bright blue dot for Democrat. Make of it what you will. The general trend over time is from the top right to the lower left of the graph, and the highlighted dots appear in strict right to left chronological order, from Ike at the right though Kennedy-Johnson, Nixon-Ford, Reagan and Clinton to G. W. Bush at the left. 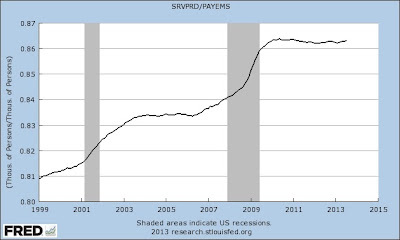 A similar graph of 13-year averages tells the same story, but with all of the the dots landing closer to the trend line. It does appear from graph 3 that lowering the top rate from 91% to 70% might have been associated with higher RGDP growth. 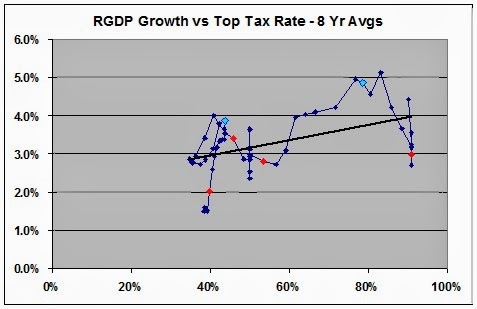 But, note from graph 2 that the spread of RGDP values at 91% is far greater, and that the highest individual RGDP values are at the higher tax rates. The 50’s, when most of the 91% values occurred, were characterized by a series of economic shocks and recessions as the U.S. returned to peace time conditions and absorbed several million WW II veterans into the work force. 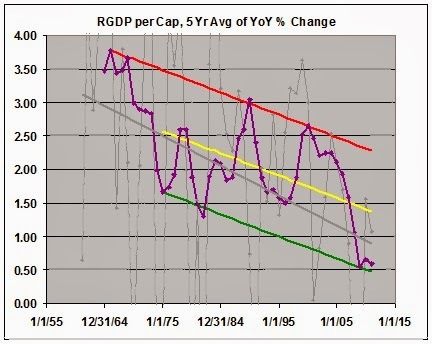 Graph 4 is a close-up view of the 8-Yr average graph starting with the Reagan administration. The eight years of the Reagan administration are indicated with red dots, GHW Bush in orange, Clinton in bright blue, and GW Bush in purple. The later is most notable for making the 8 year average of RGDP growth dive off a cliff. And before you get too excited about the transient RGDP increase in the late Reagan years, remember he also ran deficits that dwarfed anything seen up to that time. The record of the Clinton years not withstanding, I’m not going to get into a post-hoc discussion of higher taxes causing higher growth – though the data up to at least the 70% level is consistent with that assertion. Correlation is not causation. On the other hand, the absence of correlation absolutely refutes causation. What one may say with absolute certainty is that in the post WW II United States, tax cuts have never led to a sustainable increase in RGDP growth. The lone possible exception is the cut in the 60’s from 91% to 70%. It’s plausible that cutting from an extremely high tax rate might be beneficial, but, due to the extreme volatility of the early post WW II period, the effect in that case is not at all clear. So if anyone tries to tell you that cutting taxes in the current set of conditions will stimulate growth, feel free to show them this post. * Top marginal tax rates from Citizens for Tax Justice. Capital Gains Tax rates from the Tax Policy Center. Using data from Census Bureau Historical Income Table H-08 and CPI data from FRED (index 1982 to 84 = 100), I was able to calculate real median household income (RMHI) from 1984 to 2011. 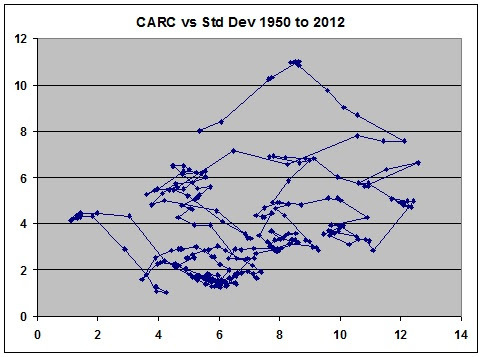 Graph 1 shows the results – annual data. Except for the bump during the housing bubble, it been a downward track for this century. During the alleged recovery from the great recession, median income has dropped badly. From this post at EconoSpeak,I found out that Census Beareau Table H-06 has a greater data range, from 1975 to 2012, and also an RMHI calculation. So I plotted their data in Graph 2. 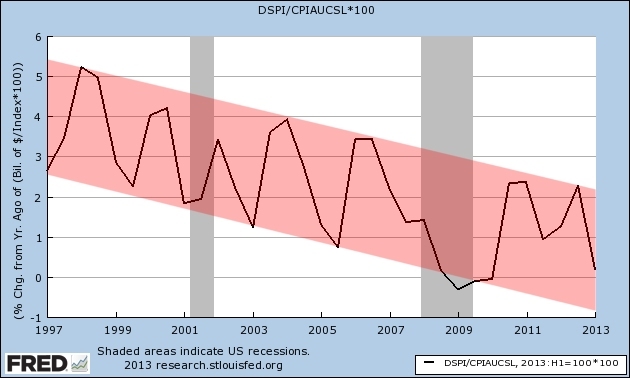 Instead of CPI, the Census Bureau uses CPI-U-RS, a research series based on constant 2012 dollars. So the numbers are different, but the picture is the same. I’ve added a trend channel, because I’m amused by that sort of thing. Presumably, the Great Recession [GR] ended in 2009, but that’s the year that the RMHI value fell below the trend channel lower boundary – possibly forever. A channel violation that severe almost always indicates that the previous trend is well and truly dead. The new trend looks pretty dismal. Welcome to hard times. By my calculation, RMHI is down by over 8% since 2000. As far back as the data goes, RMHI has taken a hit in every recession. In days past, RMHI would recover to a new high after the recession was over. There was no recovery after the 2001 recession until the bubble years of 2005-7. That ephemeral gain to a new lower high was completely wiped out by the GR in 2008. Since then, things have only gotten worse. In the Econospeak post linked above, poster Econoclast suggests that the standard way of viewing the start and end of recessions is flawed. His alternative is to consider that a recession is occurring when and as long as RMHI is falling. He then presents this table. If we consider recessions as he suggests, then the oxymoronic concept of the jobless recovery can be discarded – and good riddance. Via Mish, I found Doug Short’s article on the Deflating American Dream. He presents longer view graphs based on data from Sentier Research, who estimate RMHI on a monthly basis. Short did a lot of homework, and was able to graph RMHI back to 1967. He also compared the two inflation series and found that CPI-U-RS understates inflation, relative to the CPI. The difference is minuscule in recent years back to the mid 90’s, but expands quickly as you go back into earlier years. Graph 3 shows RMHI as adjusted by these two indexes, and also a third, PCE from BEA. There’s a lot more in the linked post by Short and in this one, as well. Both are highly recommended. The three curves don’t disagree much on the timing of declines and advances, just on the magnitudes. 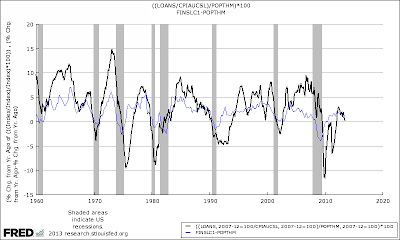 By my count, using CPI as the adjustment index and Econoclast’s idea of recession timing, we have been in recession for 21 of the previous 46 years, or 46% of the time. There’s your great moderation – I mean stagnation – in one simple, easy to understand picture. I’ve come to believe that greed really is the root of all evil. In Part 1, [here at AB] I looked at factors that tie closely with Total Capacity Utilization (TCU), and saw no reason to believe that TCU is about to surge. In Part 2 I’ll be looking at more general ideas that reinforce my lack of optimism. My underlying assumption is that for TCU to surge, the economy has to surge and pull it along. In this post, Edward Lambert takes a deeper look at capacity utilization, with a strong suggestion that it’s more important to the economy than the 16% contribution that industrial production makes to the total. So maybe I have my assumption backwards. First a H/T to Mish. Graph 1 is one He recieved from one of his readers, with the quote: “It seems rather unlikely that private economic activity is poised to accelerate under these conditions.” Mish concurs, and so do I. 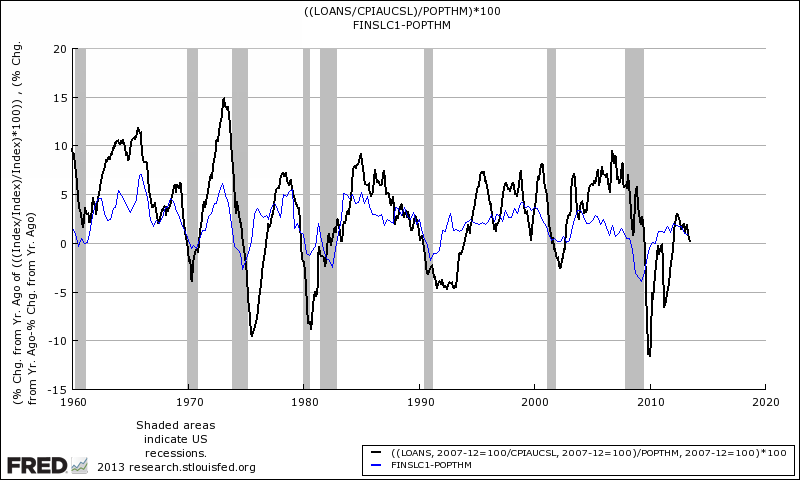 The graph shows Growth in Bank Lending Per Capita (Black) and Real Final Sales Per Capita (Blue). Both are rolling over from extremely anemic recovery peaks. Next, a huge H/T to Stagflationary Mark at Illusion of Prosperity, who sometimes looks at data and relationships that I would never even think of, and often goads me into a different perspective. He has graciously allowed me to use some graphs from several of his recent posts. Graph 2 shows the YoY % change in capital goods orders for non-defense industries. Mark added a twelve month moving average which is clearly sloping down, and is now at 0%. In the following graphs, all trend lines and modifications are Mark’s. 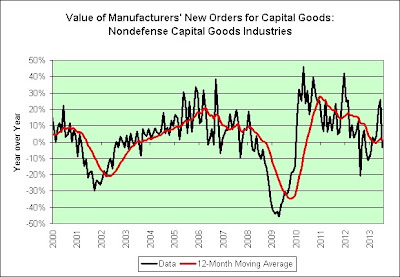 Graph 3 shows Real Manufacturers’ Sales per Capita. I’ve added TCU in blue. Since the beginning of this data set in 1990, it looks as if these sales have to grow in order to keep TCU constant. Alas, though, they’ve leveled off. If TCU is going to surge, I’d expect robust hiring in manufacturing industries. 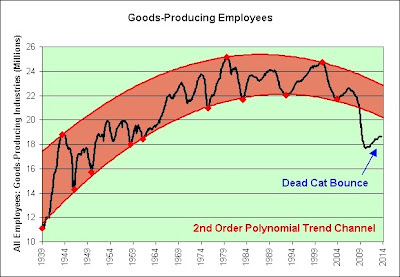 Graph 4 shows the number of employees in goods-producing industries. In what passes for a recovery in this century, it’s approaching flat-line at a level equal to that of 50 to 60 years ago. 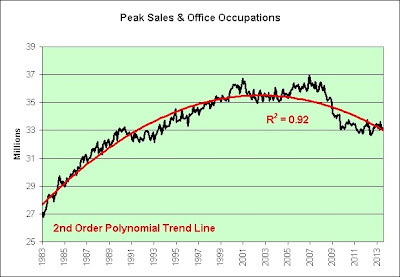 And, lest you think non-manufacturing employment can bail us out, Graph 5 shows the employment level in sales and office occupations. Since the GR, it has made no recovery at all, and is now at a level from 20 years ago. But maybe none of this matters in a service-based economy. 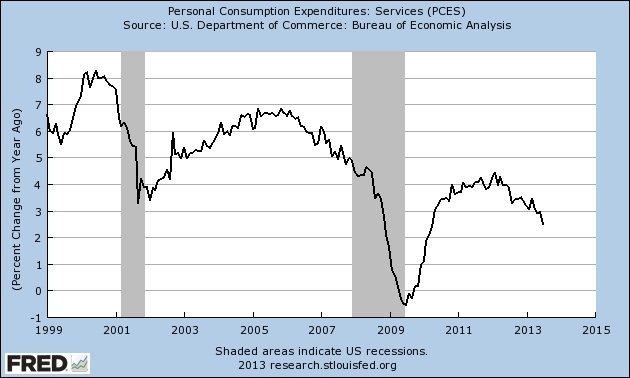 Graph 6 looks at the YoY % growth in personal consumption expenditures on services (PCES). Surprisingly, though, expenditure growth in that area has been declining with a series of lower lows and lower highs since 1980. The post GR high is at the level of the previous recession’s low, and the long range decline in growth rate resumed a year and a half ago. This is probably why the fraction of employees in service industries has flat-lined, as shown in Graph 7. I’ll wrap up with one last consideration. Our economy is about 70% consumer driven. If GDP and TCU are going to surge, it will be largely due to a surge in spending. Contrary to what economists will tell you, for the majority of the population spending is driven by income. Or, more specifically, by real disposable income. Graph 8 gives us a look at how that is going, YoY % change, semiannual data. Not so well, as it turns out. I’d really like to be wrong about this. But I can’t think of any reason to suspect that I am. In comments to this post, the idea is floated that capacity utilization (TCU) is about to surge. Graph 1 shows employment in those three industries. Mining and Utilities are placed on the right hand scale, because the numbers employed are much smaller than those in manufacturing. But in some small way, a surge in capacity utilization would certainly be good news. Unfortunately, though, I don’t believe it’s in the cards. Here’s why. Graph 2 shows total capacity utilization (TCU) since 1967. The main trend has been down since the beginning of FRED data. Furthermore, TCU has now stagnated for over a year and a half, and might even be ready to roll over. It has never increased from this type of condition. In fact, the only surges (except for one in the late 80’s that followed a slight decline) have come off of deep troughs. But – just because something has never happened doesn’t mean it will never happen. Still, things happen for reasons, and I’m trying to suss just what those reasons might be. 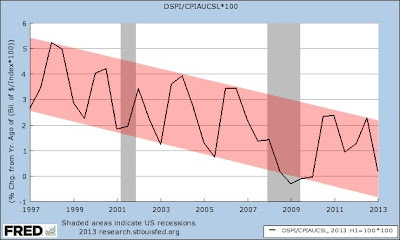 Graph 3 shows TCU vis-a-vis YoY % change in GDP. As GDP growth goes, so goes TCU. Not exactly lock-step, but the contours are generally similar as both have declined over time. Coming into the Great Recession (GR), the decline in GDP growth led the decline in TCU, and something similar might be happening again now – and from already historically low levels in both. In this post, Art suggests that private fixed investment as a fraction of total debt is a fair barometer for economic growth. I’ve modified that idea to look more specifically at non-residential private investment (PNFI) as a fraction of non-financial corporate debt (NFCD, or NCBTCMDODNS in FRED-speak), since industrial activity is what I’m chasing. Graph 4 shows that ratio, vis-a-vis TCU. Except for the late 80’s bump that TCU and GDP growth share, the motions are generally consistent. The PNFI/NFCD ratio is already rollng over – from by far the lowest peak on record. 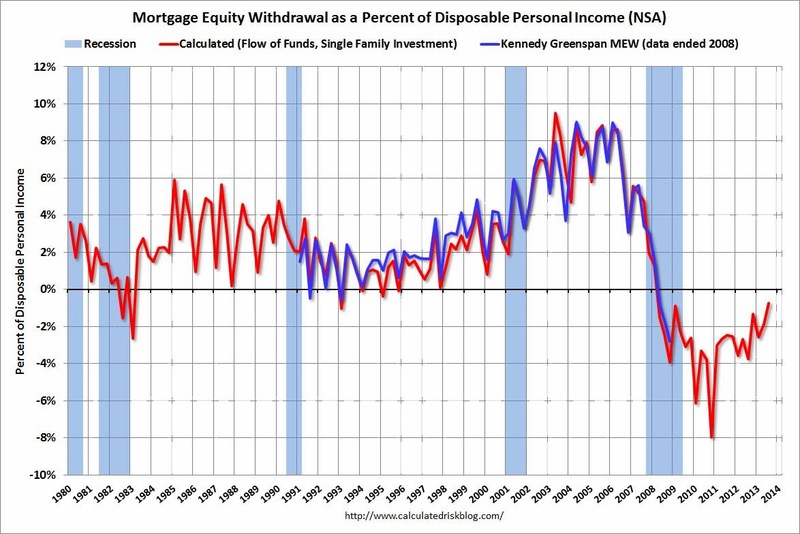 As graph 5 shows, fixed investment has barely eked out a new recovery high, while borrowing, which barely slowed down during the GR, has soared to unheard of highs. I wonder where the money is going? Nothing in these pictures gives me any reason to be optimistic. With the anemic stimulus package now long gone and the FED getting ready to taper, everything looks contractionary. Help me if I have any of this wrong. There are several more non-encouraging factors to consider, and I’ll get to them in part 2. 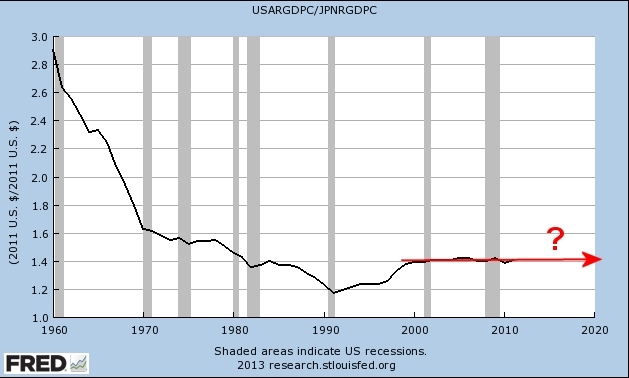 This is a follow up to The Standard Deviation of NGDP Growth During the Great Inflation. In that post I showed this 100 point scatter graph of the 12 Quarter average Compounded Annual Rate of Return [CARC] of NGDP vs 12 quarter Standard Deviation [Std Dev] of CARC from 1954 to 1978. It then occurred to me that some of those red dots that have fallen down close to the yellow trend line might be misallocated. 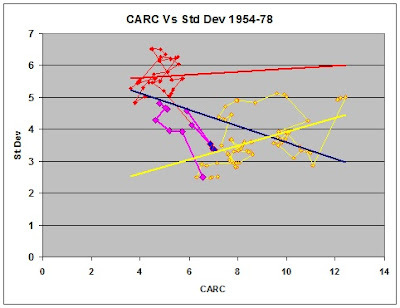 What they represent are 3 quarters in 1957 when Std Dev had a chance to settle down between recessions, and the tumble down of Std Dev in the early 60’s as the high Std Dev values of the the 1960 recession fell out of the 12-point data kernel. This is illustrated in Graph 1. The red dots are data points from 1954 through Q1 ’62. The yellow dots are from Q1 ’64 on. The blue dots are the three low Std Dev points from 1957, and the pink dots represent the transitions in and out of the 1957 blue-dot data, and the tumble down in Std Dev from Q2 ’62 to Q4 ”63. The original blue trend line is retained for comparison. Note that removing these three blue and 8 transitional data points from the pre-1964 data set causes the negative correlation of that period to completely evaporate. This might seem a bit arbitrary; but now we can observe a more tightly packed red data set, and the behavior of the pink data points does seem to be unusual. 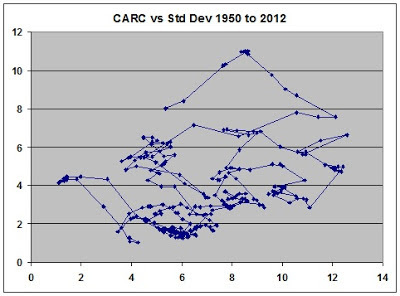 The string of high side outliers in the yellow data set occurs in 1971-2, and is associated with the 1970-71 recession. This piqued my curiosity, so I took a look at the bigger picture – all 253 quarterly data points from Q1 1950 through Q1 2013, shown in Graph 2. I see the great majority of these points clustering or stringing out along imaginary upward sloping lines that suggest coherent data subsets, and a relatively small number of points [39, or 15.4% of the total] where the data is in transition between sets. In three year periods ending in 1954 to 1978, which overlaps with the Great Inflation, the 12 quarter standard deviations of the compounded annual rate of change in NGDP are significantly *negatively* correlated with the average rate of change in NGDP. In other words NGDP became *less volatile* as its average rate of change *increased*. Let’s have a look. 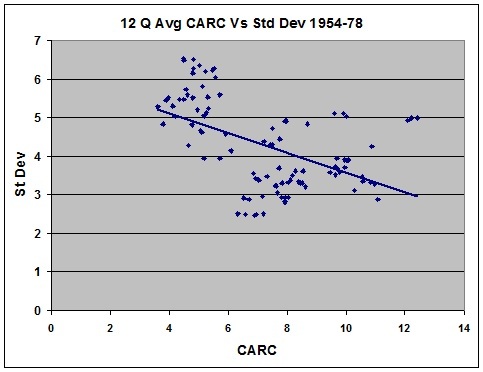 Graph 1 is a scattergram of 12 Qtr average NGDP growth from this FRED page, measured as Compounded Annual Rate of Change [CARC] vs Std Dev for the years 1954 through 1978. A linear trend line is included. At first glance it appears that Mark is right. But there is something strange about that data distribution. Do you see it?